At Duluth's Whole Foods Co-op, a produce worker helps a customer choose organic oranges. A customer at the Whole Foods Co-op gets help with an item in the bulk food aisle. More and more people are choosing to buy organic food, but now some poor people are finding they don't have the option. The Women Infants and Children Program, or WIC, helps low-income women feed their families better. The program covers nearly half the babies born in the U.S. every year. Minnesota's Health Department, which runs the WIC program in the state, has told participants they can't use WIC vouchers to buy organic food anymore. They say it's too expensive. The Whole Foods Co-op in Duluth is trying to persuade the state Health Department to reverse the ruling. Duluth, Minn. — Stacie Stone is a regular customer at the Whole Foods Co-op in Duluth. Two years ago, when she was unemployed and pregnant, she enrolled in the WIC program. Her vouchers allowed her to get about sixty dollars worth of healthy food every month. "I think the cool thing about it is that it's cheese and orange juice and stuff that's good for you," says Stone. Before getting the WIC coupons, Stone didn't drink much orange juice. "After that I always had it, so this is good." In September, a clerk at the co-op told her she wouldn't be able to use WIC vouchers for organic food anymore. Stacie Stone called the WIC office to cancel her next appointment. She only eats organic food. "I believe that it's better for you," she says. "It's better for your health, it's better for the environment, and it tastes a lot better!" The State Health Department runs the WIC program in Minnesota. The people there say it's a matter of cost. Rick Chiat helps run the program. He says more and more people are applying for WIC vouchers, and money is tight. To avoid having to put people on a waiting list, the Health Department focused on finding ways to keep costs down. So now, WIC vouchers don't cover organic food. "Organic foods are anywhere from 1-1/2 to 2 times the cost of non-organic foods," Chiat says. "It's really an issue of the dollars we have available and needing to stretch those as far as we can." The people who run co-ops, including Sharon Murphy at Duluth's Whole Foods Co-op, say organic food doesn't cost that much more. "Certainly it's not the problem anymore that organic products are not competitive across the board," Murphy says. "At different times of year, depending on crop failures or smaller crops than expected, sometimes the price is still higher by more than five per cent. But usually the prices are much more competitive." Murphy says only a small number of co-op customers use WIC vouchers, but buying organic food is an option they should have. She says the very purpose of the WIC program is to encourage people to eat healthy food. The Whole Foods Co-op offered to mark down its organic foods and take a loss, in order to keep supplying their customers. But Health Department officials said no. They said making an exception in Duluth would be unfair to consumers in other cities. So the Duluth co-op decided to drop out of the WIC program. The Wedge in Minneapolis - a much bigger co-op - is also dropping out, and the Mississippi Market in St. Paul is thinking about it. 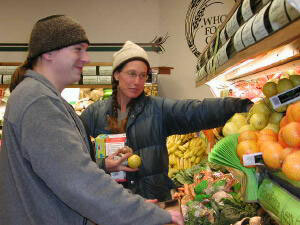 The co-op in Duluth is preparing a petition to ask the Health Department to reconsider the ban on organic foods. So far 200 people have signed it. They're also talking with a national co-op group about pressuring the Agriculture Department, or even Congress, to make the rules more flexible around the country. The state Health Department isn't sure how much money it can save by not allowing organic foods. It will take a look at its list of approved foods again in a couple of years.